Used to be such a classic and a special treat at the Hayes House! 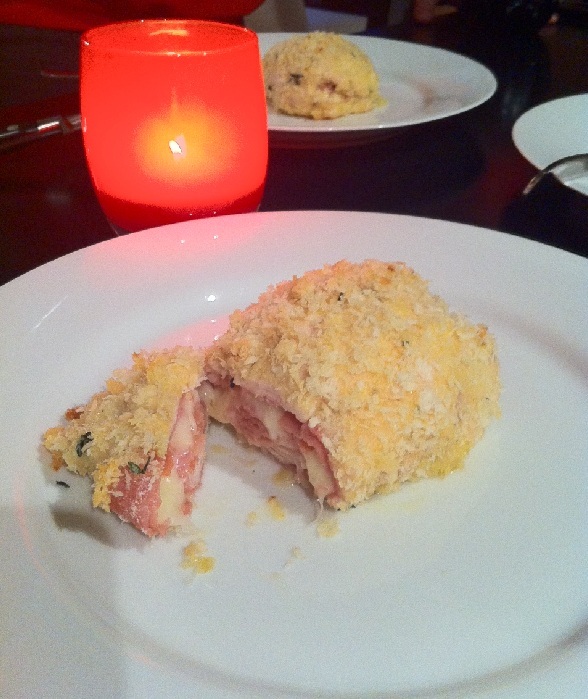 There are several different ways to prepare Chicken Cordon Bleu, the major differences are whether you use ham vs prosciutto, swiss cheese vs gruyere and bread crumbs vs panko. Because I have never ordered Chicken Cordon Bleu in a restaurant, I only remember the way my dad used to prepare it- ham, swiss and bread crumbs. I never thought I would actually prepare this dish at my home, but after seeing it on the menu at Marcela’s Creole Cookery, I was inspired to give it a try! After deciding my approach (thanks for the ideas Tyler Florence!) – prosciutto, 1/2 swiss, 1/2 gruyere and panko bread crumbs…fancy, I know :0) Mark and I ran to the market to pick up the ingredients. Alright…this looks difficult but really, it is super easy! Don’t let the multiple rolls, dip and dabs scare you- when it is done, it is done! Put two breasts between two pieces of plastic wrap and gently pound the chicken to approximately 1/4 inch thick. 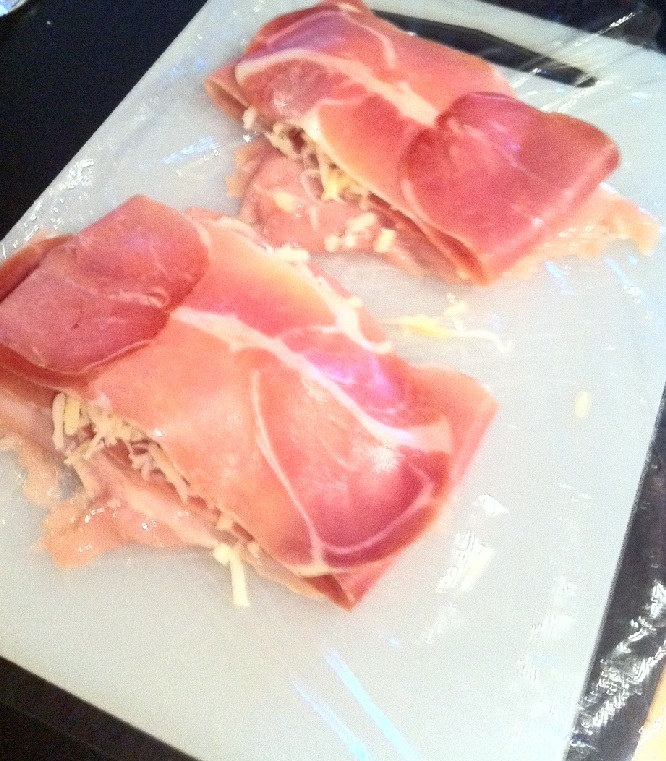 Remove the top piece of plastic wrap and lay one slice of prosciutto down on each breast. Top the prosciutto with about a quarter of the combined swiss/gruyere cheese mixture and then sandwich a second piece of prosciutto on top. Roll the breasts up tight inside the plastic wrap and seal the log gently by twisting both ends of the plastic wrap- like a tootsie roll! Prepare the other two breasts just the same. Get three bowls out. One for the flour, one for the panko bread crumbs and one for the eggs. 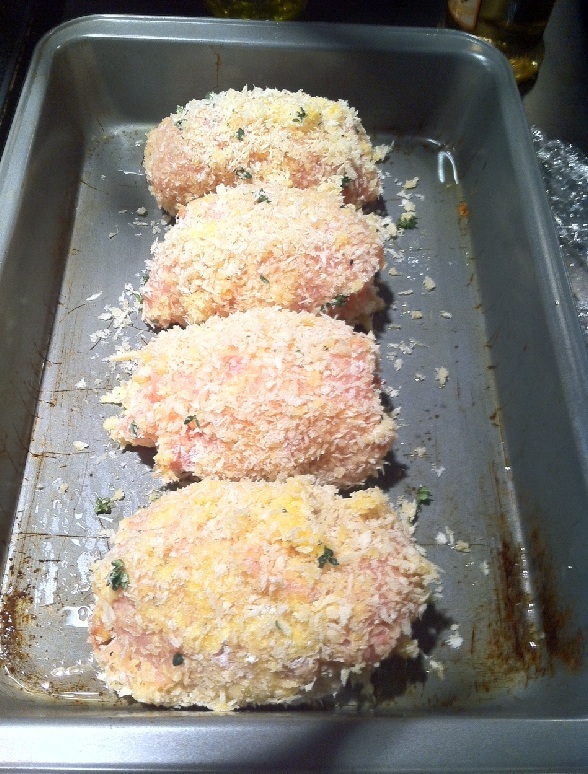 Mix the panko with thyme, minced garlic and melted butter. Remove the plastic wrap and roll the chicken in the flour, dip in the egg mixture and coat/dab completely with the panko. One thing I didn’t do before doing my roll, dip and dab was preparing my baking pan…SO make sure you do :0) Lightly coat a baking pan with olive oil and then put each roll onto the pan. Bake for about 25-28 minutes until brown and cooked completely. Maggie, Mark and I had a great family din din and I even had a piece of chicken leftover for lunch the next day…so good!! baked to perfection! I present Chicken Cordon Bleu.